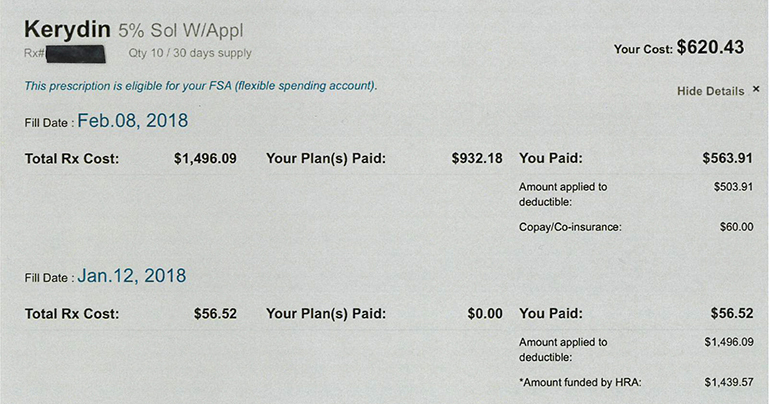 Note that this is Kaiser Health News monthly feature provided jointly with NPR to analyze medical bills. If you have a bill you’d like to see if they will puzzle out, can submit yours here. Be sure to give the background. The Medical Treatment: Shortly after the physician assistant phoned in the prescription to My Express Care Pharmacy, in Maryland, the pharmacy contacted Soloviev for her health insurance information. There are many prescription treatment options for toenail fungus — both older medicines in pill form and newer topical treatments such as Kerydin, said Dr. Shari Lipner, an assistant professor at Weill Cornell Medicine and director of its nail unit. The patient in this case would have been a candidate for “quite a few” of them. Patients should play defense and ask their physicians about the cost of every new prescription. They should ask again at the pharmacy — even if that means calling a mail-order pharmacy. Because costs can vary depending on each patient’s coverage, they may need to contact their insurance carrier or the PBM that handles their medicine claims. The patient’s actual “cost” over the two months would most accurately be represented as the sum of the two months’ Rxs–about $3000–plus two $60 copays. “You Paid” should be what she actually paid, either out of pocket or through the HRA, and any fees or copays that were covered by drug company rebates should be clearly noted as CHARGED but ABROGATED. Why your pharmacist can’t tell you….